List Rules Vote up the craziest beauty contraptions. As the old aphorism goes, "beauty is pain." It's a philosophy that goes back a long way, and spans a myriad of bizarre practices from sadistic (if whimsical) weight loss techniques to the barbaric practice of foot-binding. Today's beauty regimens are comparatively less extreme, on the whole, but not to worry: the world still abounds with strange and exotic techniques for making oneself alluring. Read on to find out why people encapsulated their heads in Medieval-torture devices, allowed themselves to be impaled through the mouth, bored holes into their cheeks to make dimples, and even (literally) set themselves on fire. All in the name of glamour and eternal youth. "Therapists prepare a special towel soaked in a ‘secret elixir’ and a little alcohol. The towel is then lit up, only to be put out just a few seconds later with another towel. [The technique] is said to stimulate the skin and address dullness, sagging and wrinkles. And it isn’t just for beauty, it is said to relax the muscles and make you feel great as well." Does a forest fire feel "great" as it consumes massive acres of trees? It's a question worth pondering, but at least you get to look fabulous as you mull it over. People Who Were Actually Killed For Being "Witches"
"Italian physician Dr. M. Matarasso began using carbon dioxide to freeze off freckles in the '30s. A sharp point, like a lead pencil, was used to remove each individual freckle and after a week, the skin would heal freckle-free. Although Dr. Matarasso revolutionized the use of dry ice, he also gave us a thousand nightmares and this image burned into our brains forever." The Vintage News put it best: Max Factor's "Beauty Micrometer," invented in 1935, actually looks like something out of Hellraiser. Designed to "help in the identification of the areas of a person’s face which need to have their appearance reduced or enhanced by make-up," the contraption was basically an immobilizing birdcage. It's also rather reminiscent of the famous "forced viewing" scene in A Clockwork Orange... not a normal thing to look for in your beauty products. 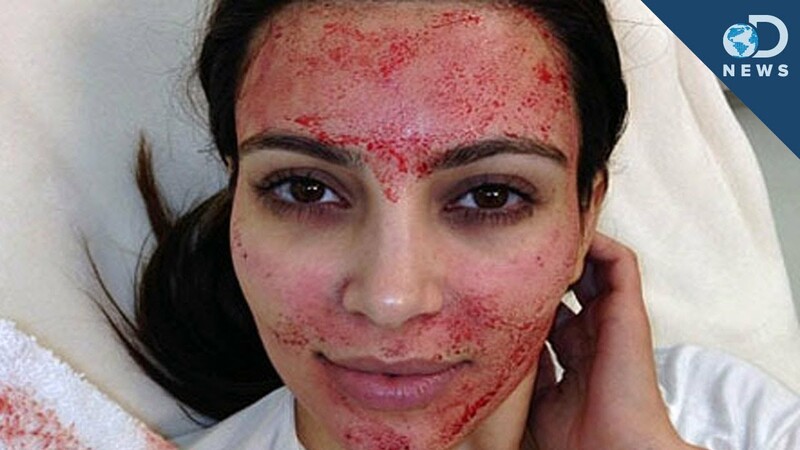 A few years ago, Kim Kardashian made headlines when she smeared her own face with her own blood for the sake of beauty. Since then, the trend appears to have caught on - mostly in the form of a vampire cream created by one Dr. Barbara Sturm. "For the bespoke cream, she funnels a client's blood through a special vial that stimulates the blood to react like you've been injured. It's those resulting, healing proteins that fuel the cream... what I did not realize was that Dr. Sturm would be taking our blood right after the wait staff took our coffee orders. She set up shop at the bar and started taking blood from a line of increasingly anxious editors." The verdict? The cream worked like a charm, so the next time you get a blood test, it might be a good idea to ask if you can keep the sample.